Daruma dolls are an icon at this time of year. They are a common practice of various people to make wishes for the New Year. You can easily recognize them if you visit a shrine or a temple as they are a round red doll with a face without eyes on it. The tradition itself started in Gunma where it is claimed that in the town of Takasaki, specifically at Shorinzan Darumaji, the Daruma was born. The tale states that the priests were always busy making charms for the locals. The problem was that charms often last for just one year and the monks couldn’t really keep up with the demand, so they encouraged the locals to make their own charms based on wooden moulds and the monks would bless them. 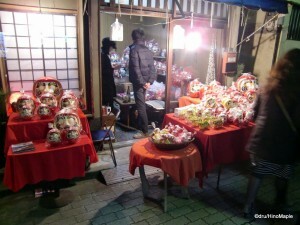 This tradition would become popular in Takasaki and the entire town became known for Daruma dolls. Takasaki is still the largest producer of Daruma today with about 80% of the total production in Japan. Takasaki is still working hard to keep their claim to fame as they still have a major festival at the beginning of the year where they sell thousands of Daruma dolls. Daruma come in many sizes and colours. The most common version is a red Daruma. From what I can understand, it comes from the original colours of a monk’s clothing. Daruma itself is a representation of the Buddhist monk named Bodhidharma, or in the short Japanese phonetic form, Daruma. Daruma are generally made of papier-mache and the majority of the red ones come weighted so that they always return to the standing position. Daruma are very popular for people who have specific goals in life. They are especially popular during the election season as most politicians buy one and then make a wish to win the election when the campaigning starts. 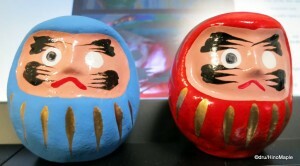 Daruma are created without eyes because you need to paint the eyes yourself. The goal is to paint one eye as you make your wish and then paint the other eye when it comes true. Everything I have read says that you should paint the right eye. The only problem is that the majority of people don’t specify which eye is the right eye. I decided to paint the Daruma’s right eye, rather than the eye on the right, in hopes I had it right. Unfortunately, I may be wrong and the Daruma’s left eye is the proper eye. This isn’t a big problem as it is all superstition anyways. When searching for information for this post I discovered that it does appear that the doll’s left eye is the most popular but there were several images showing the right eye being painted as well. I’m not too sure which one is correct, but unless you truly believe in a superstition, there isn’t any need to worry. The main thing to understand is that the one eye is open to keep an eye on you and make sure you are working towards your goal. Red: Red is the general one. The base meaning for good luck and fortune, however if you are unsure about which one you should get, red is the default. White: White is the colour of love. It is designed for relationships. You can often see red and white Daruma being sold as a set to promote luck, fortune, and longevity as a couple. Yellow (Gold): Yellow has always been associated with money. Yellow is similar to gold and the yellow Daruma is for people who want great riches. Yellow isn’t just about money as it can also be used for fame and other things like that. Gold is also available and this one is specifically for wealth. Black: Black is not specifically designed for helping you achieve something, rather to prevent things. Black is designed to prevent natural disasters as well as any other natural ailments. Blue: Blue is for work, or school. From what I can tell, it is designed to help people improve their work environment, or their company’s status. It is also used for people who wish to improve their education. Green: Green is for health. Only one website had information on this, but a lime green was to help recover from illness, while a darker green was for improving your health and fitness, such as helping you win a game. Pink: Pink seems to be self-evident. While it isn’t popular, it is for finding love. Silver: Silver seems a little strange but from what I can understand, it is for improving your social position or being able to change yourself. I’m not too sure as to what it really means but it seems interesting. *For links to websites with information about each colour, please see the end of this post. As you can see, there is a lot of information about the Daruma, yet there isn’t that much to know. It appears that the Daruma doll itself is a relatively recent “invention” as this tradition was started in the mid-1700s. It is still a fun tradition and something that I have seen but have never truly looked into until this year. With my hopes and ambitions to get a product for my company, I decided I needed a little help to get it going, so I decided this would be the first year I would try to make a wish and set a goal with the Daruma doll. One unfortunate thing is that these dolls are not cheap. For a small one, they start at around 1000 yen each. The two I bought are the same size and cost 1000 yen each. I was expecting about half the price, but Japan and lucky charms are going to be expensive. I’m not disappointed as it is an interesting little lucky charm and I am hoping that it will help me this year. Hopefully I’ll have another report in a few months if my first wish comes true. This entry was posted in Culture, Japan and tagged Bodhidharma, Buddhism, Budhism, Budhist, charm, Daruma, Daruma Doll, Darumaji, doll, Gunma, Happy New Year, japan, lucky charm, New Year, paper-marche, Shorinzan, Shorinzan Darumaji, superstition, Takasaki by Dru. Bookmark the permalink. I’ll keep ’em crossed that the blue one does his job! It’s valid for only one year? Oops. I think most people only know the red ones. I didn’t know of the different colours until I went to the shrine. I want to go to a temple next time now that I learned Daruma is a Buddhist tradition. Next year I’ll do it. Maybe I’ll make a trip to Takasaki. That’s a cute story. Reminds me of a few exams I saw on the internet. You can see some here: http://funnyexam.com/ I couldn’t find the one I was thinking of though. Although I think some may be difficult for you. Ru should understand them all. Does daruma dolls be a birthday gift as well and still can make their wishes or it does only work for New Years ? Gi2: You can certainly buy a daruma for a birthday gift and it should work. New Year’s is just the most popular time to buy them. Where did you get that specific Daruma doll? I’d been looking all over online. I can’t find it. There are some in amazon, but not that specific one. 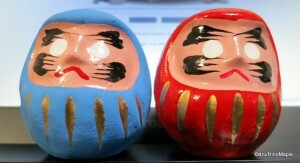 Sorry, I can’t remember exactly where I got these Daruma. It is one of 2 places. If I got it here, it was during the new year so there won’t be any left. You have to go during the new year holidays when they have a special booth set up for this, although it can be spotty on certain years. This is because it is a Shinto shrine, not a Buddhist temple. This is the major daruma temple in the Tokyo area. 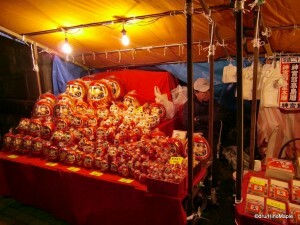 In the new year they have several daruma booths set up and you can pick and choose based on size. I’m not sure if they have sales outside of the new year season but they may.